I got it from eBay for $35. 32 GB in 4 channels, 8 x 4GB sticks. 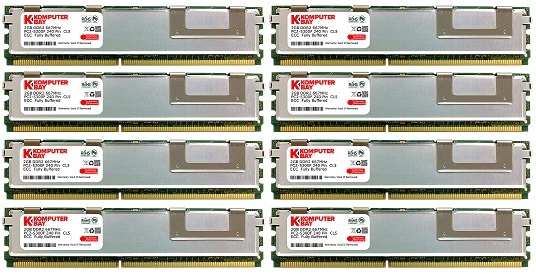 Fully Buffered DIMM, PC 5300. Slow, comparing to what you can buy now (2015), but 32GB for $40 is a great deal. It gets quite warm, original HP workstation has a dedicated 80mm fan, I am cooling it with 120mm fan. Two Intel Xeon e5420 CPUs. Each has 12MB L2 cache and 4 cores, each core running at 2.5 GHz. 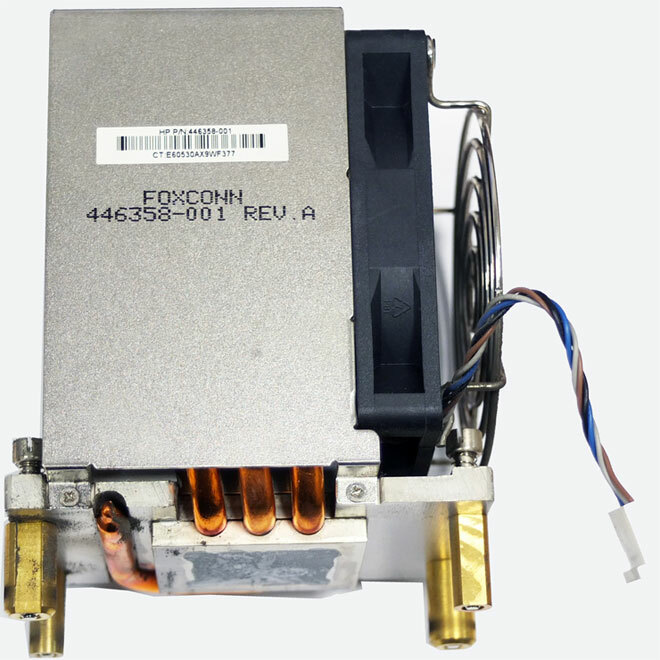 80W max heat dissipation. CPUs may not seem much by 2015 standards, but PassMark benchmark gives the dual setup ~6450 points, which puts them in the high-end cpu range, at pair with AMD FX 6300 six core CPU. One came with the motherboard, another was $20 on eBay. Of course both have same stepping. When e5450 (Quad 3.0GHz) go down in price, I will upgrade the CPUs. Probably the most expensive part for XW6600 on eBay. Each sells for around $40, and this setup needs 2. Fortunately, I was able to find a pair for $20, plus $20 shipping. They are heatpipe based, with 4 pin fan connector. Thermal management functionality of the motherboard is very well implemented, they mostly are running on low speed, almost inaudible. I had to add a 3D printed duct for the top CPU, as it was not getting enough cool air. More about it below. Antec Three Hundred. Great design with great amount of air flow. Using 120mm Yate Loon D12SL-12 for: 2 x front intake, 1 x side intake, 1 x memory, 1 x rear exhaust. Using low profile Scythe 120mm for top exhaust. The case by default uses 140mm fan, but due to the proprietary format of HP motherboard it would not fit there. I had to 3D print 140mm to 120mm fan adapter, and use a low profile fan. Problem solved. Using Panaflo 80mm FBA08A12L for PSU exhaust. CPUs have 80mm fans, chipset has 40mm fan. There's also 40mm fan for top CPU cold air intake. All intake fans have mesh dust filters, and create positive pressure in the case, thus minimize dust intake and accumulation. Because of how CPUs/heatsinks are located on the motherboard, and how Antec 300 has its PSU on the bottom of the case, top heatsink is quite offset from intake fans and is not getting enough cool air. This resulted in its temperature being usually 10C / 18F higher from the bottom CPU, and under full load computer would shut down to prevent top CPU from overheating. Duct helped to reduce temperature to levels where computer no longer shuts down due to thermal CPU overload. Thank you HackForge for letting me use your 3D printer. If you are experiencing POST Error: 917-Front Audio Not Connected, and you have no audio harness plugged into the Front Audio connector, just connect Pin 1 with Pin 10 using female-female jumper wire. This motherboard checks for a presence of a valid front audio harness during boot-up. It does it by determining if Pin 1 is connected with Pin10. If no such connection is present, POST Error 917 is shown, asking for F1 to be pressed in order to continue with boot-up. If all the required fan headers have fans attached, USB pins and Front Audio pins are jumped as described here, you will no longer be asked to press F1 to continue with boot-up (assuming no other issues are detected). If you are experiencing POST Error: 918-Front USB Not Connected, and you have nothing plugged in into the FRONT USB header, just place jumper on pins 8 and 10, as per picture. 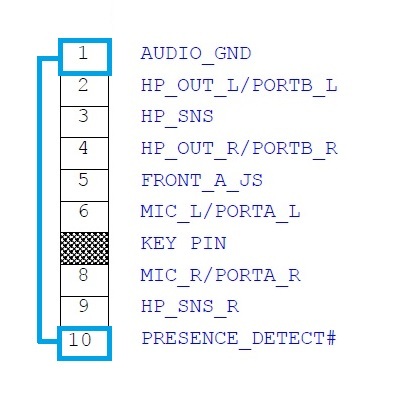 If you have something connected to the FRONT USB header, ensure Pin 10 (the lonely one) is connected to the ground. PIN 8 is ground on the header. 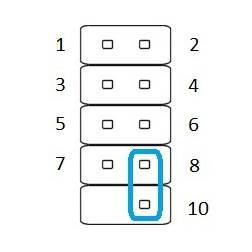 Pin 10 is usually not used in the USB header plugs. 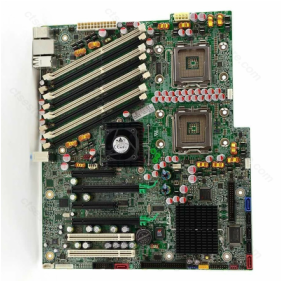 However, many HP motherboards use it to detect presence of a valid USB wire harness. If no valid harness is detected, motherboard displays the error message, and asks for F1 to be pressed in order to continue boot-up. 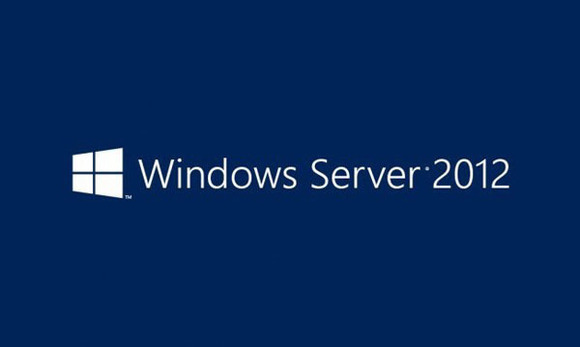 Using Microsoft Windows Server 2012 R2. Since the e54xx processors do not have SLAT, I can't use Windows 8.1 and Hyper-V. Windows Server 2012 R2 does not have this restriction.